I am the mother of three summer babies and live by the ocean, so my babies went to the beach. It is usually cooler at the beach, especially at low tide, so it was a great place to spend part of the day amongst the soothing sounds of the sea. Here are my tips to keeping your babies safe at the seaside! Invest in a good quality beach tent with SPF protection. I like the three-sided ones with pouches along bottom that you fill with sand or rocks to hold it down, in addition to stakes that come with it. Make certain there are vents for air flow because it makes a big difference! Aim the solid side towards the sun to provide the most shade, and you may need to adjust the angle of the tent during the day. My tent was big enough for me to sit under while I nursed, room to change baby, for their seat or to spread a towel out for tummy time. 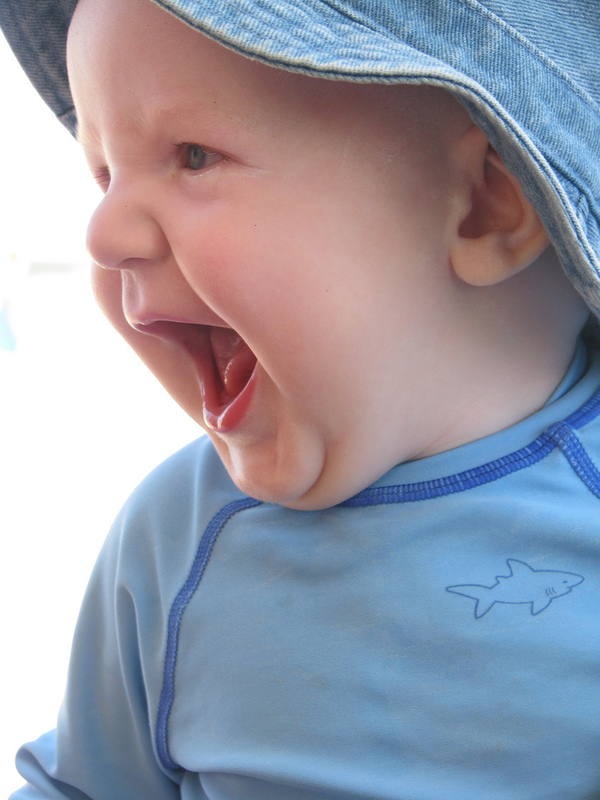 Make certain to keep babies out of direct sunlight, and remember, babies under six months can’t wear sunscreen. Dress the baby in lightweight, light-colored, loose clothing. Don’t forget a sun hat, preferably one that ties and covers the backs of their neck. A mosquito net is also a good investment to use in your yard, on the beach, or out on walks. Very fine netting with elastic around the edges can go around a seat or the stroller. Concerned about AC or a lack thereof? Generally, your baby needs one more layer of clothing than you do. When in doubt, check their temperature with an axillary thermometer, and it should register in the 98 degree range. Snuggling or nursing babies can get pretty sweaty in the summer. You may want to consider giving the baby a bath as part of your daily routine. Sprinkle a little corn starch on your palm, and then rub it on baby. Avoid talc, and spraying the cornstarch in the air which can get into your baby’s lungs. Consider wearing your baby and both of you can enjoy a walk in the fresh air. If possible, try to head to the beach earlier in the morning or later in the afternoon when the sun is less strong. Moms, do not forget yourselves! You do need to wear sunscreen, and make certain to pack lots of cold drinks and food for you. It is easy to get caught up in what the baby needs and forget about yourself! Relax and enjoy the summer with your little one! Looking for more information? Check out our Boston-area newborn care classes!